This Simple Education Essential Guide to Coronary Angiography, Stenting and Structural Intervention course will give participants real knowledge and insights into how to become successful in interventional cardiology practice. Designed and run by leading international experts in the field. The course will steer you through from A to Z of contemporary interventional practice to ensure you are safe and confident in your approach and management of patients. 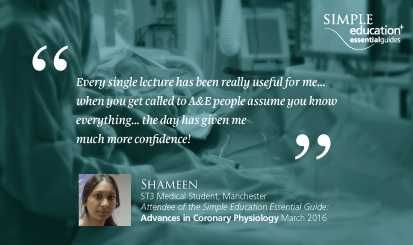 Welcome to the ‘Essential guide to Coronary Angiography, Stenting and Structural Intervention’ course, designed for busy Cardiology trainees, Interventional Fellows, aspiring cardiologists and consultants looking for a rapid and simple up date in this field. The course is the first of its kind to incorporate live cases, short lectures that cover the key points (delivered by leaders in the field) and encompass the interplay between the pharmacology, imaging, and devices in interventional cardiology. The course is made of 4 one-day modules which include topics that will be encountered by all cardiologists regardless of specialization and are therefore designed to provide the definitive update in coronary and structural intervention for the practicing clinical cardiologist regardless of sub speciality. Delivered in dedicated conference facilities in the heart of London with easy travel links. This course is organised and run by Simple Education and is kindly supported by Medtronic and Volcano. Bioresorbable Vascular Scaffolds: The future in our hands?